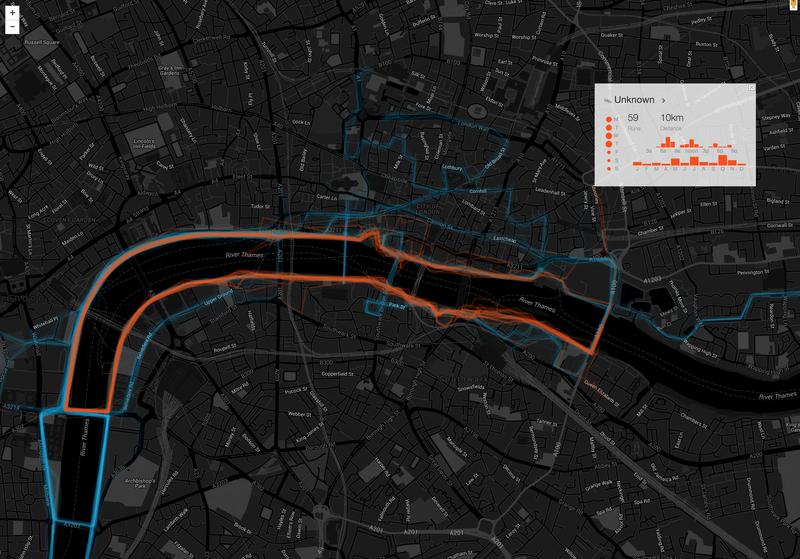 Clusters is a project by Strava Labs to visualize the top routes from within their data. 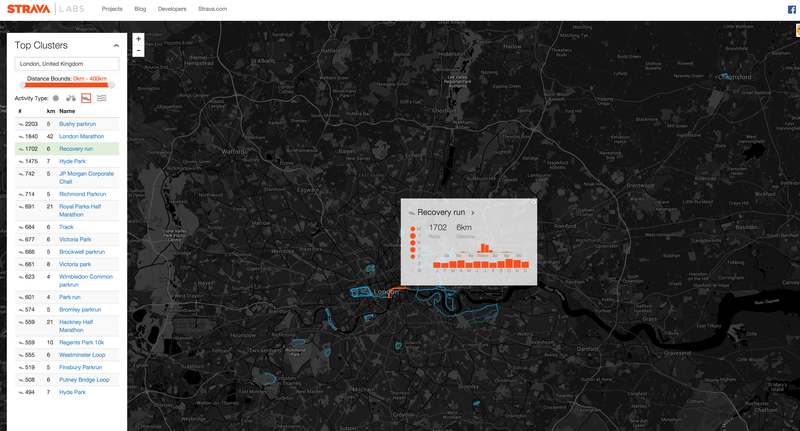 Their labs projects are often exploring some of the more interesting things you can do with the data when millions of people around the world log their cycling and running activity. Races predominate the Reading clusters for running with the Reading Half in the centre and both local park runs popular. Taking a look at running in Reading, formal races and training sessions predominate. There is the Reading Half Marathon route at the top but also plenty of local 10k races such as the O2O, Dinton Pastures, Shinfield and Royal Berkshire 10k events. The Reading and Woodley park runs take 2nd and 3rd sport with the Reading roadrunners track sessions at Palmer Park coming in 4th. All local activities show an interest in triathlon and cycling events but not much evidence of regular commuting. When you look at all activity types in Reading you get some more triathlon and duathlon events and the Wokingham bikeathon. 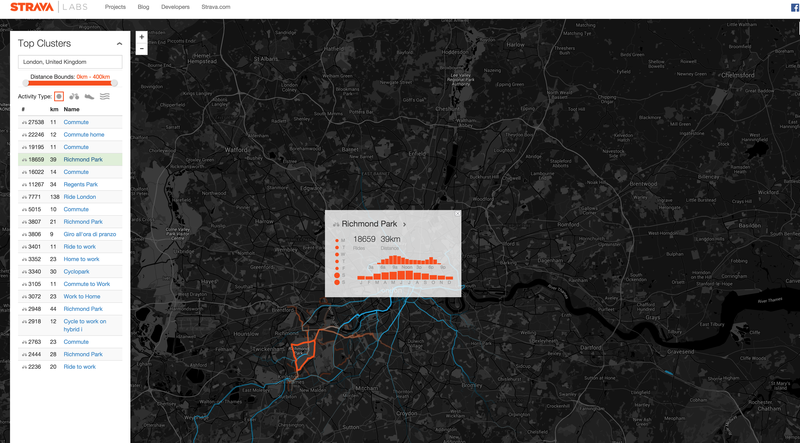 The picture for London shows a lot of cycle commuting and regular (all hours of the day, days of the week and months of the year) cycling in Richmond park. Cycle commuting into London is more popular as is cycling around Richmond Park and Bushey Park Run. Looking just at running in London, the marathon ranks 2nd but it is Bushey Parkrun that is the most popular route with London’s parks and commons being well utilised by runners.The most intriguing is a 6km route simply labelled Recovery Run, a year round work day lunchtime escape. Amidst more formal race or Parkrun routes is this daily lunch break between London’s twin cities. Running along the Thames and back between the City of London and the City of Westminster seems to be a regular way for city workers to relax and escape work at lunchtime. 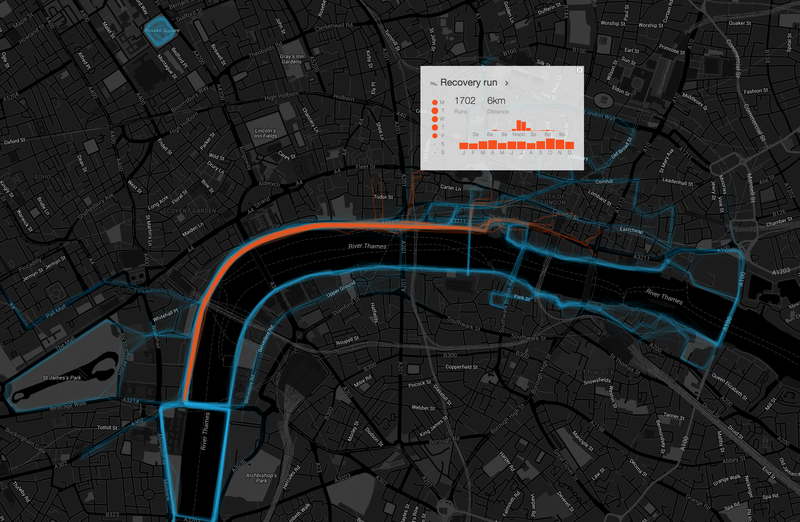 It’s unclear if the recovery is from harder running or from work but it’s nice to imagine city workers jogging along the Thames from the City to Westminster and back at lunchtime, or enjoying a 10k loop of north and south banks as part of a lunchtime escape or run commute. Also enjoyed as part of a lunch break or run commute is this 10k route taking in the north and south bank of London’s Thames. 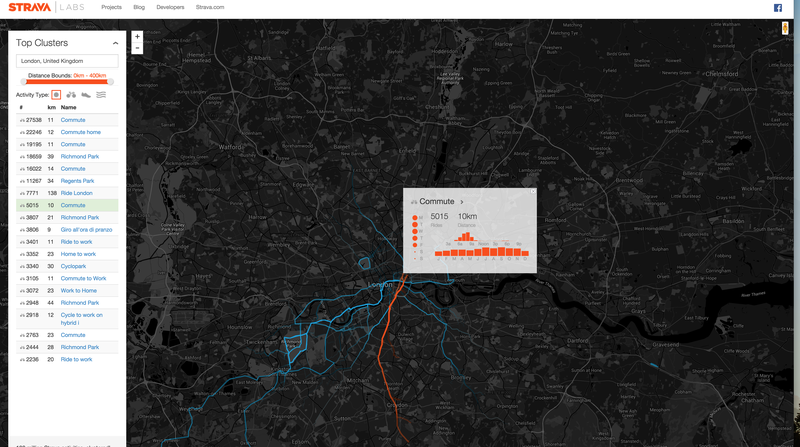 The visualisations are obviously based only on data uploaded to Strava, not all logged activity, and there isn’t much information about how the data is processed but it’s another interesting example of the kinds of insight you can get from the quantification of regular exercise and might give local councils and planners pause for thought.